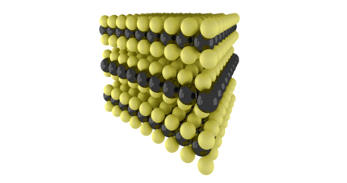 Films of layered substances like WSe2 can exhibit a reduction in the out-of-plane thermal conductivity of more than 1 order of magnitude compared to that of the bulk, effectively beating the glass limit (Science 2007, 315, 351). Here, we investigate the microscopic contributions that govern this behavior within the framework of Boltzmann transport theory informed by first-principles calculations. 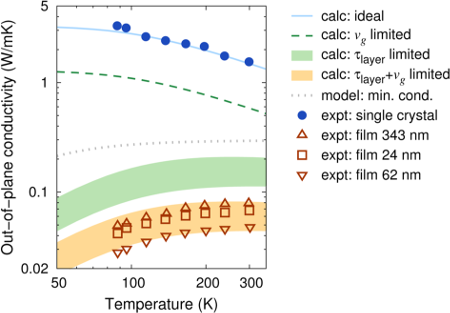 To quantitatively reproduce both the magnitude and the temperature dependence of the experimental data, one must account for both phonon confinement effects (softening and localization) and interlayer scattering. Both stacking order and layer spacing are shown to have a pronounced effect on the thermal conductivity that could be exploited to tune the balance between electrical and thermal conductivity.